“Ocular Energy Path” is creation life force energy, for we are the Eyes of God, we are Source, we are Divine Creators, we are everything and anything. You ever see a star explode or a galaxy create itself from seemingly nothing? This is what this piece conveys: the sheer energy, mass, force and light in the process of a budding and new creation. It speaks to the Eyes for these are our powerful inner visions; we have the capacity to see beyond the mere mind, the intellect. Now while these things are crucial as well, we can also expand beyond our consciousness, beyond our limitations to access the Infinite Source of Creation. And so this is what this piece reminds us of, to access all that we are, for we are ever expanding light energy in each and every moment and we can manifest matter and shape and create to our life’s pleasing and resonant purpose. Enjoy it all. Enjoy everything you are and everything you create during this lifetime here. Peace and Blessings. Namaste. God, Jesus and Archangel Michael are with me in the creation of the piece and the now displaying of its message and healing channeled energy. God Bless. Peace. Love you all. Namaste. God, Jesus and Archangel Michael, and Daina. Peace and Blessings. Namaste. xoxo. This is one of my Divine Healing Artworks. May the channeled blue light, violet light and purple rays fill up your heart, soul, being and spirit and grant you much healing and eternal bliss. Peace all. Love, Daina. Namaste. Emerald Dreams: The Divine Creation and Inspiration of All There Is, Creator Source. 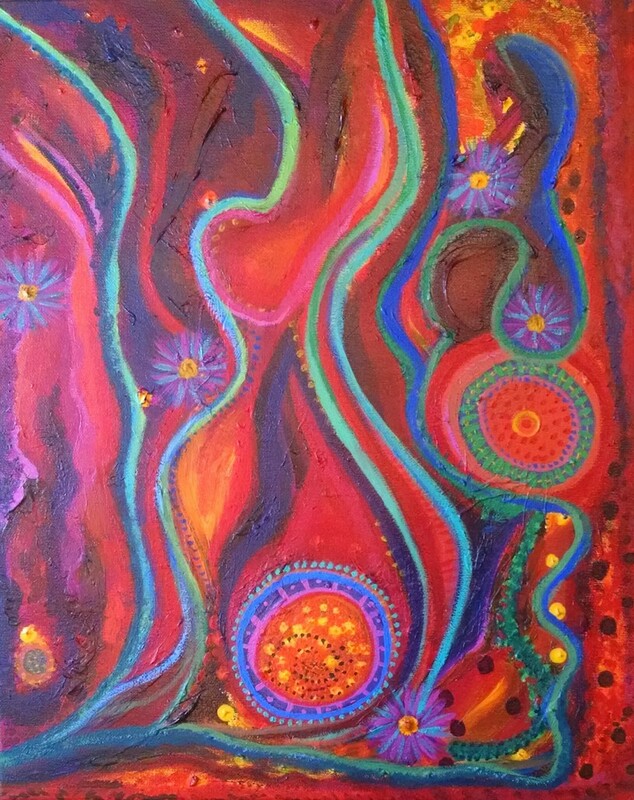 This is one of my Healing Paintings. May you enjoy the Blessed Healing energy it creates and emanates. Peace all. Love you. <3 Daina. <3 Namaste. The Light of God rises from the depths of Healing Oceanic Waters. Allow His wisdom to flow through you and wash away waves of feelings, pain and emotions. Allow all of God's Light to pour through you and allow yourself to transform and heal as you move further and higher on your Ascension Path, your Walk of Light, your Path of Light, with all of the Angels, Divine Ones and Ascended Masters. God Bless. Blessings Be. Namaste. Peace, Love and Light, Eternally So. Namaste. Love and Healing Divine Light, Daina. <3 Ascended Master Guides abound here. <3 Peace. When we walk with God, all is well, all is love and all is peace. Enjoy the radiant heart light this blessed piece of art holds and allow it to awaken within you your own Divine God essence. Allow your inner heart to shine bright from which God can then grace you with His Divine Peace, Healing and Love. All you have to do is be willing to surrender to His Good Grace, Divine Blessings and wonderful plan for your life. The river flows, as does God's love. Mother Mary is here to teach us that we all have God's love within us and we can access it at anytime. Let her love flow through you now so she can access your heart light and bless you with Divine Peace. Let God show you His ways. Surrender and release and let the waters heal and restore you and nourish you as the fires burn away all that no longer serves you. "Silent, She Emerges" captures the female body and womb as she emerges from her childhood ways to womanhood and the Divine Feminine power that she holds and carries forth into the world. Namaste.